Pakistan announced Thursday that Saudi Arabia has agreed to join and invest “heavily” in its ongoing China-funded bilateral infrastructure and industrial development projects. Prime Minister Imran Khan’s extensive meetings with the Saudi leadership during this week’s official visit to Riyadh resulted in the landmark development, the Pakistani information minister said. As part of President Xi Jinping’s global Belt and Road Initiative (BRI), Beijing is investing billions of dollars in Pakistan to help the close ally build and upgrade the transportation network, power plants, expand the deep-water port of Gwadar on the Arabian Sea, establish industrial zones to enhance Pakistan’s capacity as a manufacturing hub in the region. “Saudi Arabia is the first country that we have invited to become a third partner in CPEC. They will be our third strategic economic partner in CPEC, and Saudi Arabia is expected to bring massive direct investments to the project,” Minister Fawad Chaudhry told a news conference in Islamabad. Chaudhry added that Saudi Arabia plans to send a senior-level delegation, including their ministers of finance and energy, to Pakistan in the first week of October. The two sides during the visit will “lay the foundation of a major economic partnership” between the two countries. The move is likely to cement traditional close relations between Islamabad and Riyadh. “Saudi Arabia’s active participation in CPEC is a welcome development as it shows the success of CPEC," said Senator Mushahid Hussain, head of the foreign affairs committee of the upper house of the Pakistani parliament. "It will help counter negativism about CPEC emanating from India and the United States, and it also highlights the importance of Pakistan as the pivotal player in regional economic cooperation,” Hussain told VOA. New Delhi and Washington both have been critical of CPEC and BRI in general. 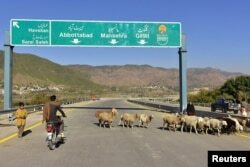 India suspects the project has hidden security objectives and says a portion of it is being built on the disputed Kashmir territory. Pakistani and Chinese officials dismiss those objections as politically motivated and maintain CPEC is "purely an economic initiative." “CPEC has not inflicted a debt burden on Pakistan, rather when these projects get completed and enter into operation, they will unleash huge economic benefits ... and these will bring considerable returns to the Pakistani economy,” Wang said. While Islamabad’s ties with Washington have deteriorated, Beijing has deepened bilateral economic and military relations with its South Asian partner. Russia also has stepped in and is rapidly reviving bilateral ties in all fields with old rival Pakistan. Pakistan’s tensions with the U.S. stem from allegations the country is harboring terrorist sanctuaries used for attacks against American and local forces in neighboring Afghanistan — charges Pakistani officials reject. Beijing and Moscow both have praised Islamabad’s efforts against terrorism, saying they have contributed to regional peace and stability.